What products are Vegan certified? 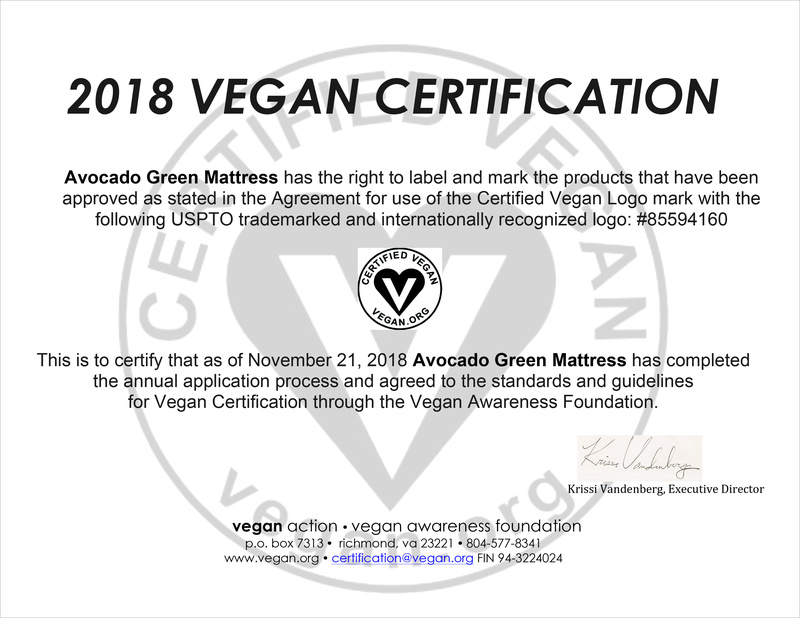 Our Avocado Vegan Mattress, Green Pillows, Mattress Protector and Vegan Latex Mattress Toppers are certified by Vegan Action. At Avocado, we are dedicated to sharing the benefits of Veganism, and actively support our customers that make a life-long commitment to being vegan and living animal-friendly lifestyles. To this end, many of our products are certified and verified by Vegan Action / The Vegan Awareness Foundation in Richmond, Virginia. These products do not use wool and do not contain animal products or byproducts and have not been tested on animals. Our vegan products include our Avocado Vegan Mattress, Green Pillows, Organic Mattress Pad Protector and Vegan Natural Latex Mattress Toppers. What does the Certified Vegan logo mean? The Certified Vegan Logo is a registered trademark, similar in nature to the kosher mark, for products that do not contain animal products or byproducts and that have not been tested on animals. The certified logo is easily visible to consumers interested in vegan products and helps vegans to shop without constantly consulting ingredient lists. Since we do currently make some products that use wool, we have demonstrated acceptable steps that we take to thoroughly clean and sanitize all surfaces, tools and machinery used between vegan and non-vegan production cycles to minimize cross-contamination where share machinery is used.